The KonMari method - a minimalist approach to cleaning and decluttering - has turned Marie Kondo in a celebrity of sorts. From a best selling book to her very own Netflix show, Kondo has helped a countless number of people organise just about anything. Her simple rule is the following: Place all similar items on the floor and touch them one by one. If a thing doesn’t “spark joy,” you should thank it for being a part of your life, and donate or trash it. But what about the office? Can you apply the KonMari method to your office or even your work station? If so, how? However, there is one slight modification. At Nimbus, we recommend only keeping things that sparks joy or will use in the next six months. This article provides some tips. For employees, how to tidy your desk? While tackling each category one by one, always put everything in one pile. For example, for books and magazines, stack all books in one spot before you attempt to hold each item in your hand and ask the simple rule of whether or not you will use it in the next six months or if it sparks joy to you. In clearing your desk and as you hold each item in your hand, take the time to visualise how they connect to how your work which would aid you in the simple rule above. 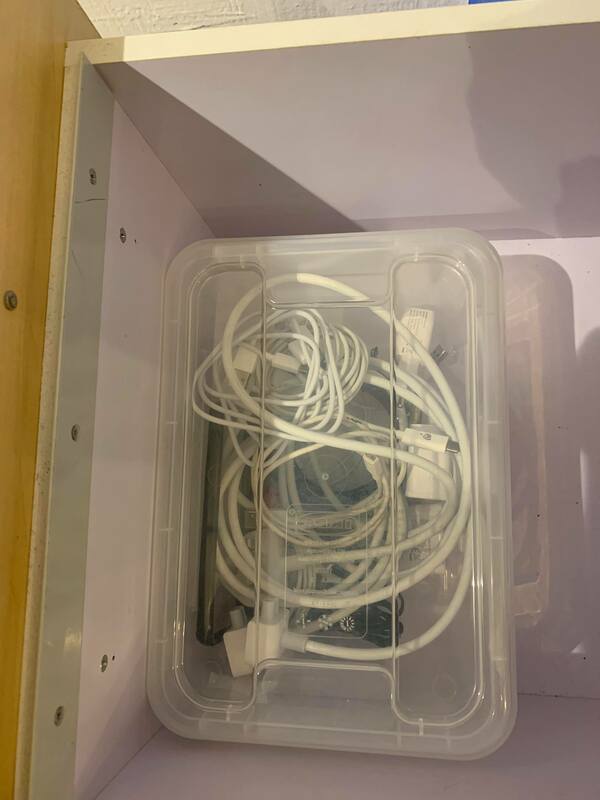 Tip: Don’t put individual items in your drawer; instead put things in boxes and then put these boxes in your drawer. It creates a tidier and neater desk drawer. Once you have cleared your desk, remember to take the opportunity to either wipe your freed up desk space or get the office cleaner or janitor to help you disinfect the table. For office managers, it is also appropriate to start thinking about the above items but from a bigger picture. For instance, if people are accumulating books in the office, consider creating a library-like area in the office for people to read and do quiet work. When it comes to preventing paper and documentation overload, digitisation is important, so you reduce filing and physical paper storage. If some departments like Finance and HR requires that, ensure that there are enough cabinets and desks with proper filing drawers or nearby storage. Once storage is in place, encourage everyone in the office to recycle useless paper as much as possible or shred paper to prevent sensitive information from leaking for easier trash hauling and disposal. 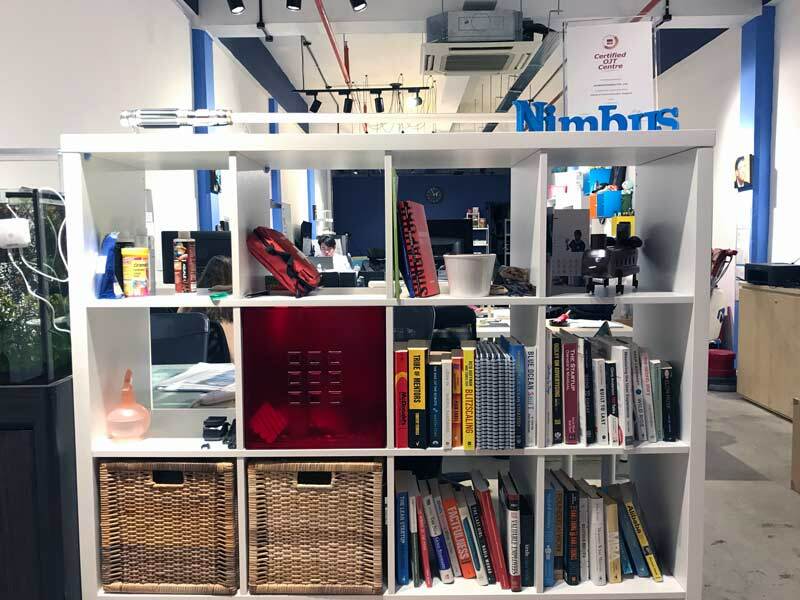 While offices tend to have less sentimental items, it is possible to have old company logo T-Shirts, newspaper cuttings or Business Awards lying around. It is best to digitise or frame up as much of these old company SWAG so you can transform them and serve as a company timeline and a source of pride for your employees. Framing up sentimental items creates a source of pride for your employees. 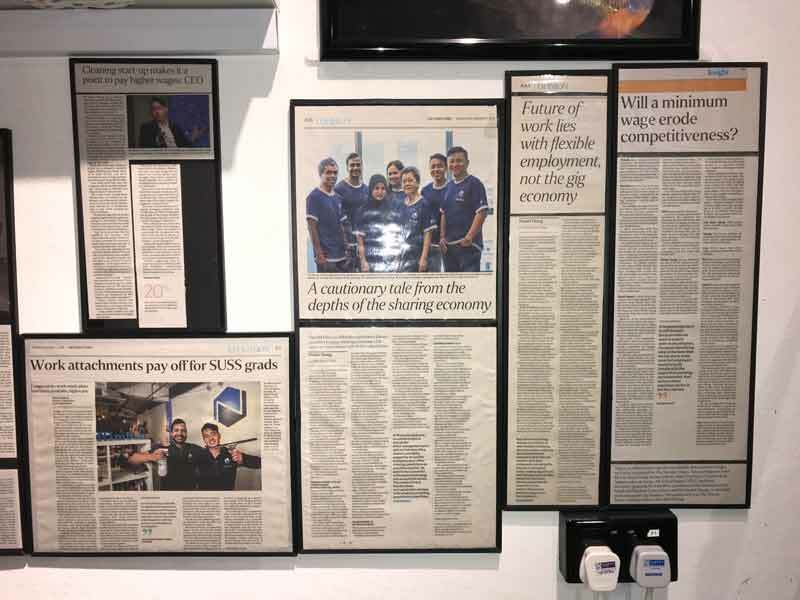 At Nimbus, we frame up our newspaper clippings. These are some examples of creating a more decluttered and organised office for you and your colleagues to work more efficiently. And finally, as Marie Kondo would remind us, don’t forget to say “Thank You” to each item before you discard them away. If you need help setting up storage solutions, setting up shredding systems, recycling or cleaning up the office, Nimbus can help.